"My name's Kathy Dies, and I played mellophone and was horn sergeant for Dimensions this past summer. 2003 was my second season with Dimensions after marching with Capital Regiment in 2001. 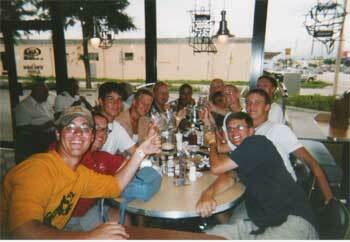 This picture was taken at A&W in Orlando during Finals week. Our brass caption head, Adam Gumbrecht, took the horn line out to dinner after a very successful season." Thanks Kathy!